Multi body parts SolidWorks offers a number of tools to help us model components easier and faster with powerful options like multi body parts and contour selection. Multi body parts means that we can have more than one “solid” body in a part. Up until now we have been modeling single body parts, meaning that each feature either added or removed material to the part, but always resulted in a single solid body. Designing with multi body parts allows us to do things that sometimes are very difficult or even impossible using a single body component, like, among other things, combine bodies, remove one body from another or calculate their common volume. 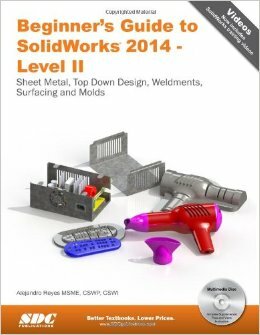 Multi body operations are particularly useful when working with mold design and is the essence of the weldments environment (both are covered later in this book). Besides working with single body parts, we have also worked with single and multiple contour open or closed sketches. In this section we’ll cover how to use Contour selection to work with sketches that contain multiple entities sharing an endpoint and/or having self-intersecting lines. We’ll learn how to take advantage of these situations and make the best of them. Another topic that is very important to modeling in SolidWorks is editing parts to fix errors or make modifications to components. After all, when we are designing, at some point we will most likely have to go back and make changes to our design, and sometimes those changes can cause trouble in subsequent features. In the Editing section we’ll cover different options available when editing parts, as well as fixing and recovering from errors.